General Aung San and the "frontier areas"
In honor of Martyrs' Day, I was looking for some videos on General Aung San on YouTube and found the following. .... we want the people of what's called the frontier areas to have the same freedom with us simultaneously and join hands with us. The phrase "frontier areas", used in the video by General Aung San, got my attention. Chin, Kachin and Shan states were apparently considered frontier then. General Aung San tried very hard so that all the ethnic minorities would be on board with the demand of independence from the British as a Union of Burma, promising federalism. He signed the Panglong agreement with ethnic leaders; Panglong agreement promised "full autonomy in internal administration for the Frontier Areas." Successive military regimes never honored that. 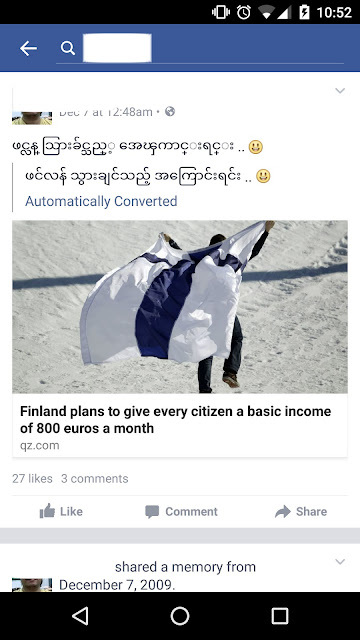 It could have avoided all the tragedies and become a true Union of Burma (or Myanmar). Sadly though, the frontier areas then are still frontier today.